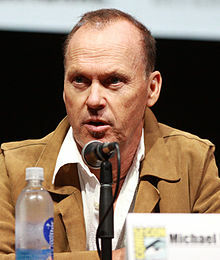 Michael John Douglas (born September 5, 1951), known professionally as Michael Keaton, is an American actor, producer, and director. He first rose to fame for his roles on the CBS sitcoms All's Fair and The Mary Tyler Moore Hour and his comedic film roles in Night Shift (1982), Mr. Mom (1983), Johnny Dangerously (1984), and Beetlejuice (1988). He earned further acclaim for his dramatic portrayal of the title character in Tim Burton's Batman (1989) and Batman Returns (1992). Since then, he has appeared in a variety of films ranging from dramas and romantic comedies to thriller and action films, such as Clean and Sober (1988), The Dream Team (1989), Pacific Heights (1990), Much Ado About Nothing (1993), My Life (1993), The Paper (1994), Multiplicity (1996), Jackie Brown (1997), Herbie: Fully Loaded (2005), The Other Guys (2010), Robocop (2014), Need for Speed (2014), Spotlight (2015), The Founder (2016), Spider-Man: Homecoming (2017), and has also provided voices for characters in animated films such as Cars (2006), Toy Story 3 (2010), and Minions (2015). Keaton's lead performance in Birdman or (The Unexpected Virtue of Ignorance) (2014) earned him a Golden Globe Award for Best Actor in a Musical or Comedy, the Critics' Choice Award for Best Actor and Best Actor in a Comedy, and nominations for the Screen Actors Guild Award, British Academy Film Award, and Academy Award for Best Actor. He previously received a Golden Globe Award nomination for his performance in Live from Baghdad (2002) and a Screen Actors Guild Award nomination for The Company (2007). Keaton was awarded a Career Achievement Award from the Hollywood Film Festival. On January 18, 2016, he was named Officer of Order of Arts and Letters in France. He is also a visiting scholar at Carnegie Mellon University. Michael John Douglas, the youngest of seven children, was born at Ohio Valley Hospital in Kennedy Township, Pennsylvania, on September 5, 1951. He was raised between Coraopolis and Forest Grove, Pennsylvania. His father, George A. Douglas, worked as a civil engineer and surveyor, and his mother, Leona Elizabeth (née Loftus), a homemaker, came from McKees Rocks, Pennsylvania. Keaton was raised in a Roman Catholic family, and is of half Irish descent through his mother. His father was of English, German, Scottish and Scotch-Irish descent and was originally from a Protestant family. He attended Montour High School in Robinson Township, Pennsylvania, and studied speech for two years at Kent State University, where he appeared in plays, before dropping out and returning to Pennsylvania. Keaton first appeared on TV in the Pittsburgh public television programs Where the Heart Is and Mister Rogers' Neighborhood (1975). For Mister Rogers he played one of the "Flying Zookeeni Brothers" and served as a full-time production assistant. (In 2004, after Fred Rogers' death, Keaton hosted a PBS memorial tribute, Fred Rogers: America's Favorite Neighbor.) Keaton also worked as an actor in Pittsburgh theatre; he played the role of Rick in the Pittsburgh premiere of David Rabe's Sticks and Bones with the Pittsburgh Poor Players. He also performed stand-up comedy during his early years in order to supplement his income. Keaton left Pittsburgh and moved to Los Angeles to begin auditioning for various TV parts. He popped up in various popular TV shows including Maude and The Mary Tyler Moore Hour. He decided to use a stage name to satisfy SAG rules, as there was already an actor (Michael Douglas) and daytime host (Mike Douglas) with the same or similar names. The claim that Keaton selected his new surname due to an attraction to actress Diane Keaton is incorrect; Keaton has said in several interviews that he searched a phone book under "K", saw "Keaton" and decided to stop looking. Keaton's film debut came in a small non-speaking role in the Joan Rivers film Rabbit Test. His next break was working alongside Jim Belushi in the short-lived comedy series Working Stiffs, which showcased his comedic talent and led to a co-starring role in the comedy Night Shift directed by Ron Howard. His role as the fast-talking schemer Bill "Blaze" Blazejowski earned Keaton some critical acclaim, and he scored leads in the subsequent comedy hits Mr. Mom, Johnny Dangerously and Gung Ho. He played the title character in Tim Burton's 1988 horror-comedy Beetlejuice, earning Keaton widespread acclaim and boosting him to Hollywood's A list. He originally turned down the role, then reconsidered like most of the cast. He now considers Beetlejuice his favorite of his own films. That same year, he also gave an acclaimed dramatic performance as a drug-addicted realtor in Clean and Sober. Keaton's career was given another major boost when he was again cast by Tim Burton, this time as the title comic book superhero of 1989's Batman. Warner Bros. received thousands of letters of complaint by fans who believed Keaton was the wrong choice to portray Batman. However, Keaton's performance in the role ultimately earned widespread acclaim from both critics and audiences, and Batman became one of the most successful films of 1989. In the early 2000s, Keaton appeared in several films with mixed success, including Live From Baghdad (for which he was nominated for a Golden Globe award), First Daughter, White Noise and Herbie: Fully Loaded. While he continued to receive good notices from the critics (particularly for Jackie Brown), he was not able to re-approach the box-office success of Batman until the release of Disney/Pixar's Cars (2006), in which he voiced Chick Hicks. On New Year's Day of 2004, he hosted the PBS TV special Mr. Rogers: America's Favorite Neighbor. It was released by Triumph Marketing LLC on DVD September 28, 2004. In 2006, he starred in Game 6, about the 1986 World Series bid by the Boston Red Sox. He had a cameo in the Tenacious D short film Time Fixers, an iTunes exclusive. The 9-minute film was released to coincide with Tenacious D in The Pick of Destiny. Keaton reportedly was cast as Jack Shephard in the series Lost, with the understanding that the role of Jack would be a brief one. Once the role was retooled to be a long-running series regular, Keaton withdrew. The part was then given to actor Matthew Fox. The show ran for six seasons, with the Shephard role continuing throughout. Keaton starred in the 2007 TV miniseries The Company, set during the Cold War, in which he portrayed the real-life CIA counterintelligence chief James Jesus Angleton. The role garnered Keaton a 2008 Screen Actors Guild nomination for Outstanding Performance by a Male Actor in a Television Movie or Miniseries. Keaton provided the voice of Ken in Toy Story 3 (2010). The film received overwhelmingly positive acclaim and grossed over $1 billion worldwide, making it one of the most financially successful films ever. He announced in June 2010 his interest in returning for a Beetlejuice sequel. He played Captain Gene Mauch in the comedy The Other Guys. In 2014 he played the OmniCorp CEO Raymond Sellars in the RoboCop remake as a more active antagonist, taking Robocop's wife and child hostage making Joel Kinnaman's character struggle to overcome the 4th directive. Keaton starred alongside Zach Galifianakis, Edward Norton, Emma Stone, and Naomi Watts in Birdman or (The Unexpected Virtue of Ignorance) (2014), playing Riggan Thomson, a screen actor, famous for playing the iconic titular superhero, who puts on a Broadway play based on a Raymond Carver short story to regain his former glory. He won the Golden Globe Award for Best Actor in a Musical or Comedy for his portrayal of Thomson and received an Academy Award nomination for Best Actor. In 2015, Keaton appeared as Walter V. Robinson in the film Spotlight, and in 2016, he starred as businessman Ray Kroc in the biopic The Founder. On July 28, 2016, Keaton received a star on the Hollywood Walk of Fame, located at 6931 Hollywood Boulevard. In 2017, Keaton played the supervillain The Vulture in Spider-Man: Homecoming and Stan Hurley in American Assassin. In 2019, he played the villain in Disney's live-action adaptation of Dumbo, co-starring with Colin Farrell and Eva Green. In 2018, it was reported that Keaton would reprise his role as Adrian Toomes/The Vulture in Spider-Man: Far From Home. Keaton was married to Caroline McWilliams from 1982 to 1990. They had one son, Sean, in 1983. He had a relationship with actress Courteney Cox from 1989-95. Keaton, a longtime Pittsburgh resident and fan of its sports teams, negotiated a break in his Batman movie contract in case the Pittsburgh Pirates made the playoffs that year, although they ultimately did not. He also wrote an ESPN blog on the Pirates during the final months of their 2013 season. In the 1980s, Keaton bought a ranch near Big Timber, Montana, where he spends much of his time. An avid fisherman, he is often seen on the saltwater fishing series Buccaneers & Bones on Outdoor Channel, along with Tom Brokaw, Zach Gilford, Thomas McGuane and Yvon Chouinard, among others. Keaton endorsed Senator Bernie Sanders for President in the 2016 U.S. presidential election. Keaton was honored with the 2,585th star on the Hollywood Walk of Fame for his contribution to Motion Picture presented to him by Leron Gubler, the President and CEO of the Hollywood Chamber of Commerce, located at 6931 Hollywood, Blvd. Herbie: Fully Loaded Raymond "Ray" Peyton, Sr.
1977 Mary Hartman, Mary Hartman The Robber Episode: "2.90"
1977 Maude Chip Winston Episode: "Arthur's Crisis"
1978 Family Tree salesman Episode: "Gifts"
2001 The Simpsons Jack Crowley (voice) Episode: "Pokey Mom"
2002 Frasier Blaine Sternin Episode: "Wheels of Fortune"
2003 King of the Hill Trip Larsen (voice) Episode: "Pigmalion"
2003 Gary the Rat Jerry Andrews (voice) Episode: "Catch Me If You Can"
2011 30 Rock Tom Episode: "100"
2019 Documentary Now! Bill Doss Episode: "Batsh*t Valley"
2019 Last Week Tonight with John Oliver Richard Sackler Episode: "Opioids II"
2019 Saturday Night Live Julian Assange Episode: "Emma Stone/BTS"
^ Waxman, Sharon (November 16, 2014). "Hollywood Film Awards: Slowly Killing the Golden Goose". TheWrap.com. Retrieved December 4, 2014. ^ "Michael Keaton Gets France's Order of Arts and Letters Honor". Variety. January 18, 2016. Retrieved January 20, 2016. ^ Kelly, Saavedra (January 12, 2015). "Actor Michael Keaton Discusses His New Role at the ETC". The Piper. Retrieved February 23, 2015. ^ "Michael Keaton Golden Globe Acceptance Speech". ^ a b "Michael Keaton profile". Filmreference.com. Retrieved September 11, 2017. ^ "How I Got Here Podcast - Michael Keaton: Part One". PodcastOne.com. May 30, 2017. ^ Vancheri, Barbara (November 13, 2002). "Obituary: Leona Douglas". Pittsburgh Post-Gazette. Archived from the original on April 13, 2013. Retrieved July 11, 2010. ^ "Michael Keaton directs 1st film". Jam.canoe.ca. January 25, 2008. Archived from the original on January 20, 2013. Retrieved April 5, 2015. 'I'm half-Irish so I can definitely talk,' he says. ^ "Film Review - Michael Keaton and his fall from grace - Independent.ie". Independent.ie. Retrieved January 30, 2018. ^ "Information about Keaton's paternal family". Retrieved August 11, 2018. ^ "Michael Keaton: 'There was a lot of bad taste in the 90s and I contributed to that'". www.theguardian.com. September 9, 2017. Retrieved August 11, 2018. 'My mom’s side of the family and my brothers and sisters are really funny – that’s the Irish Catholic side. My father’s side, the Scottish Protestant side? Not so much,' he says. ^ Blank, Ed (August 15, 1985). "'Gung Ho' crew kicks up dust in Duquesne". Pittsburgh Post-Gazette. Archived from the original on January 14, 2017. Retrieved January 14, 2017. CS1 maint: BOT: original-url status unknown (link) Part of larger section "Explore Michael Keaton's Pittsburgh roots" dated February 12, 2015. Scroll down for Blank's article. Additional on January 14, 2017. Scroll below WebCitation error messages for full text. ^ Holsopple, Barbara (June 19, 1979). "Michael Keaton off to fast start in 'working stiffs'". The Pittsburgh Press. Archived from the original on January 14, 2017. Retrieved January 14, 2017. CS1 maint: BOT: original-url status unknown (link) Part of larger section "Explore Michael Keaton's Pittsburgh roots" dated February 12, 2015. Scroll down for Holsopple's article. Additional on January 14, 2017. Scroll below WebCitation error messages for full text. ^ "Keaton offers advice to young actors", ABC.com. April 14, 2008. ^ "15 reasons Mr. Rogers was best neighbor ever", CNN.com, July 28, 2008. ^ Conner, Lynne (2007). Pittsburgh In Stages: Two Hundred Years of Theater. University of Pittsburgh Press. p. 178. ISBN 978-0822943303. ^ Kellison, Daniel. "Dinner With Daniel: Michael Keaton". grantland.com. Retrieved July 13, 2012. ^ "Explore Michael Keaton's Pittsburgh Roots". Pittsburgh Post-Gazette. Pittsaburgh, PA. February 12, 2015. ^ "The Making of Batman". Empire. August 1989. Retrieved June 5, 2015. ^ Nancy Griffin; Kim Masters (1997). "Hit Men". Hit & Run: How Jon Peters and Peter Guber Took Sony For A Ride In Hollywood. Simon & Schuster. pp. 158–174; ISBN 0-684-80931-1. ^ Hilary de Vries (February 5, 1989). "Batman Battles for Big Money", The New York Times; retrieved October 26, 2008. ^ Alison McMahan (2005). "Burton's Batman: Myth, Marketing, and Merchandising." The Films of Tim Burton: Animating Live Action in Contemporary Hollywood. Farmington Hills, Michigan: Gale; ISBN 978-0-8264-1566-0. pp. 121–56. ^ Staff (June 27, 1989). "Batman Sets Record And So Does Hollywood", The New York Times; retrieved October 26, 2008. ^ Les Daniels (2000). Batman: The Complete History. Chronicle Books. pg. 164; ISBN 0-8118-2470-5. ^ "Batman 3". Entertainment Weekly. October 1, 1993. Retrieved August 16, 2008. ^ ^ Jensen, Jeff (November 24, 2006). "When Stephen King met the 'Lost' boys". Ew.com. Retrieved January 24, 2012. ^ "The 14th Annual Screen Actors Guild Awards | Screen Actors Guild Awards". www.sagawards.org. Retrieved June 9, 2018. ^ "Keaton would do Beetlejuice 2 "in a heartbeat"". Moviehole.net. June 6, 2010. Retrieved January 24, 2012. ^ "Michael Keaton REALLY Interested in Resurrecting Beetlejuice for a Sequel". Dreadcentral.com. June 7, 2010. Retrieved January 24, 2012. ^ "Emma Stone, Naomi Watts, Zach Galifianakis, Michael Keaton to Star in 'Birdman' (Exclusive)". Hollywood Reporter. March 5, 2013. Retrieved June 21, 2013. ^ "The 87th Academy Awards | 2015". Oscars.org | Academy of Motion Picture Arts and Sciences. Retrieved January 30, 2018. ^ "Michael Keaton: Hollywood Walk of Fame". www.walkoffame.com. Retrieved October 6, 2016. ^ "Michael Keaton receives his star on the Hollywood Walk of Fame". Retrieved October 6, 2016. ^ Hipes, Patrick (May 20, 2016). "Michael Keaton Joins 'Spider-Man: Homecoming' After All – Is He The Vulture? ; 'Thor: Ragnarok' Beefs Up Cast". Deadline.com. Retrieved November 9, 2016. Michael Keaton, who in April was in early talks for a villainous role in the Sony-Marvel collaboration/reboot Spider-Man: Homecoming before falling out, is back in the mix again and we’ve been told his deal has closed. ^ Daniell, Mark (November 2, 2016). "Marvel's Kevin Feige on 'Doctor Strange', replacing Downey and the blueprint for the MCU". Toronto Sun. Canada. Postmedia Network. Retrieved November 9, 2016. ^ BWW News Desk. "VIDEO: Michael Keaton Confirms Villainous Role in Disney's Live-Action Dumbo". Broadway World. Retrieved June 26, 2017. ^ Nightengale, Bob (July 28, 2011). "Pirates are talk of baseball with captivating run". USA Today. ^ Foundas, Scott (October 16, 2014). "Interview: Michael Keaton Goes From Batman to 'Birdman'". Variety. Retrieved October 21, 2014. ^ "Buccaneers & Bones". Outdoorchannel.com. November 7, 2013. Retrieved April 5, 2015. ^ Smith, Emily (February 7, 2016). "Page Six: Michael Keaton feels the Bern". New York Post. Archived from the original on February 9, 2016. Michael Keaton is the latest Hollywood star to endorse Bernie Sanders. ^ "Michael Keaton | Hollywood Walk of Fame". www.walkoffame.com. Retrieved November 22, 2018. ^ Oparei, DeObia (November 10, 2017). "That's a wrap on #DUMBO homeward bound after a fabulous summer shooting for #Disney in #London with #timburton". Twitter. Retrieved April 2, 2018. ^ ProgressCityPublicTV (March 14, 2012). "Kraft Salutes Walt Disney World's 10th Anniversary (1982)" – via YouTube. ^ "Kent State celebrates its newest graduates". www.kent.edu. Retrieved May 12, 2017. ^ "Graduates Urged To Stand for Truth, Find Their Purpose". www.cmu.edu. Retrieved September 11, 2017. 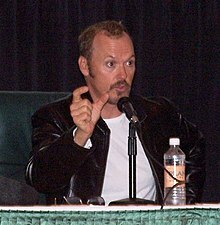 Wikimedia Commons has media related to Michael Keaton.